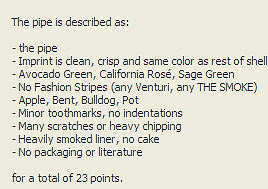 The value of pipe #587 is 23 points. Stephanie Taulbee (momacknmadismom on eBay) offered a large lot of pipes, pipe tools, and humidor/rack. One of the pipes was this the pipe. I did not have an example of this shape/color so I bid on the lot and won. The other pipes, tools, and the rack will return to eBay, while this one joins the collection. There are quite a few paint dings, but the liner and mouthpiece are good. I got a NIB example of the shape/color so this one has now joined the Pipes for Sale page. Dr. Herbert M. Burks took a liking to this one and got it to smoke.